As any orchid lover knows, these seductive clever plants have over time developed both their beauty and ingenuity to lure pollinators. The color and shape of each family type is used to seduce particular types of pollinators to them, be they bees, birds, moths or flies. The bright colorful orchids use their red, yellow and orange patterned flowers to attract day time pollinators while browner duller orchids use their powerful scent, not always pleasant, to attract nocturnal visitors like moths. Orchid families are further defined by their shape and this too determines the type of pollinator. The Cochiloda family for example has a narrow long lip that is easily accessed by the hummingbirds’ retractable tongue. By comparison the Cypripedium family have a flattened rim to their bulbous lips which makes a prefect landing spot for bees and insects. 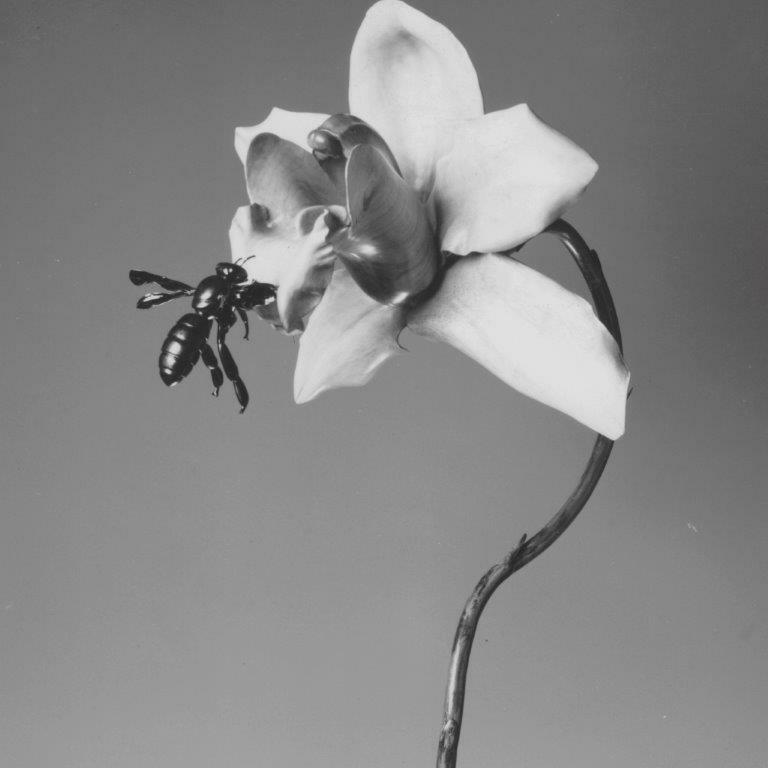 Orchids have always been one of Martin’s favorite plants and back in 1979 he sculpted an oversized 3’ sculpture with an imaginary orchid carved in cherry wood and with a realistic bee carved in ebony. More recently Martin has created a more realistic bronze orchid flower and stem as cabinet pulls. The orchid flower, while relatively small is one of our most difficult and time-consuming pieces to make. Based on the anatomy of the Phalaenopsis family the flower has 3 sepals, 2 petals, a protruding lip and a central column. To do justice to the detail and depth of the orchid, the flower is cast from 3 molds to create 3 castings, one for the sepals and petals, a second for the bulbous lip and a third for the inner column. When making a sprig of orchids a total of 7 individual castings are welded to create this 8” wide pull. For a more in-depth analysis of how different orchids and their pollinators have adapted to each other over time to create a mutually beneficial relationship follow the link below.